Welcome to another edition of #Intervue, where we feature self-made retail entrepreneurs who are in the business of selling thoughtful and beautiful products. Through this series, we hope to share entrepreneurial stories and journeys that are inspiring and relatable, while showcasing diverse brands from across the globe. Our focus, as always, is on the small-medium enterprise and the small-medium entrepreneur. Today’s #Intervue is with Anaka Narayanan. Anaka is the owner of Brass Tacks. 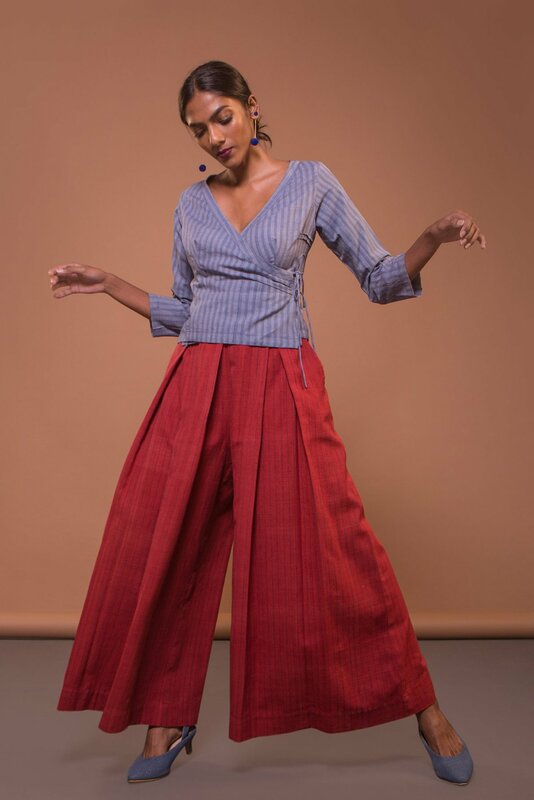 Brass Tacks is a clothing brand born in Chennai, India that looks to create beautiful, contemporary and sustainable clothing for women made from Indian textiles. We spoke to Anaka about her journey with Brass Tacks, which only recently, celebrated its 10th Anniversary – no small feat for a small business. I started Brass Tacks in as a result of my own longing for well-cut clothes made from natural and handwoven fabrics. I pursued my bachelor’s degree in New York. When I went shopping in New York I saw a lot of silhouettes that I liked, and I admired the clean lines and neat tailoring. However, I longed to see those silhouettes in hand-crafted and hand-woven fabrics that I was familiar with. When I made trips to Chennai while I was working in New York, I was disappointed that I couldn’t find affordable brands that used Indian textiles on modern silhouettes. And so, driven by the lack of garments I wanted, I moved back to Chennai in 2006 to create fashion-forward silhouettes for progressive, urban women. Brass Tacks has been around for 10 years now – so many brands, especially in retail, they open up with a bang only they shut shop in literally a year. But you’ve steered Brass Tacks for a decade now – How has that journey been? Fraught with peril! It’s funny that I’m on this end of the interview right now. I’ve spent the last six months reading and watching so many books and clips and interviews with different successful entrepreneurs from different fields. They recollect anecdotes and it resonates with me and the 10-year journey that I’ve been on. But when you boil it down to key phrases, it sounds really cheesy. When I started out, my parents told me it would be hard work. Hard work to a 26-year-old is long hours. What they didn’t tell me was that it would be lonely, there was going to be a lot of work that I wouldn’t like, and a lot of drudgery. I’m glad that on the outside it looks like one big success story, but we’ve had our ups and downs, like any other business. Every time I feel low or hate everything, this void that Brass Tacks fills is what keeps me going. The learning in the last few years has been immense! I’ve tried so many things and it’s very exciting. Some of my ideas work, some others work, but not all the time and some of them just don’t work. There’s some high that you can get out of that – I don’t think you should look at success in a unidimensional way. For me, every time I feel down and I feel like quitting – which happens every few months – I say, let’s remember why I started. Is there a need for a really well made, well designed every day clothing line made from handwoven fabric in India? Yes. There’s still a huge void for something like this in the market. In the last few years there have been a lot of indie labels who are doing phenomenal work and it’s so exciting to be part of this dialogue with them. But every time I feel low or hate everything, this void that Brass Tacks fills is what keeps me going. My favourite part of the day, is the morning. It’s when I’m alone at home with only my thoughts…and my tea. Do you have a productivity app that you use to keep track of all that you have to do? No, actually. The only app I’ve started using recently, is Headspace, for meditation. Otherwise I’m quite traditional with my to-do list. I use a notebook where I write all that I have to do. I just find it easier to do it this way. Have you ever had a customer come up to you and give you feedback which made you go Aha! Why didn’t I think of this before? I learn so much from customers – I process feedback and learning in different ways. The A-ha moments I’ve had are more related to running of a business, the administration, and marketing side of things. Somebody told me that when I’m thinking of marketing for Brass Tacks, I’m thinking about reaching out to a particular customer who’s just like me. She told me that I was being way more niche than it should be. It’s like when I go to Delhi and I’m putting out promotional material, I’m obviously thinking of a certain message, a certain image that resonated with people who were just like me. The Anakas of Delhi, if you will. She told me my demographic was much wider than that I thought it was. She was chatting with me in the store and a few people came in, and she was like, there are my cases in point. She told me I was so attached to my brand as a creator that I wasn’t seeing the bigger picture. I think my biggest A-ha moment there, was – hey, I should be detangling Brass Tacks from Anaka. They’re different. I thought they were different, but here’s proof that they’re not – there are still some links that I haven’t removed. What are your most recent milestones? Most memorable? I’ve finally found a place to outsource my production! This is huge given how particular we are about quality and given that this city only has a history of exporting men’s shirts and not women’s clothes. Also, we’re a small business – so to find somebody who can take small orders and maintain our quality standards is pretty huge. Another event – I wouldn’t call this a milestone – but an event that turned out to be a blessing in disguise was the shutting down of our Bangalore store. It triggered so many things for me in terms of learning and risk-taking the last three months. Our landlord told us we had to vacate for very personal reasons. We spent some time scrambling around looking for a place in Bangalore because we had a great market. I’d also spent some money doing up the place and for as long as the store was there, I was there every other weekend. I was physically worn out as well. So I told myself, there has to be another way to expand. I told myself that I would scale down if I had to and just took the time to regroup. Around the same time, I took on a design project and spent time with artisans in Rajasthan. I spent two and a half days away from my business and the experience was amazing. I was so productive! That was when I realized that if I wanted my creativity to thrive, I needed to physically get away from my business and administration duties. It was such a powerful realization. Anaka’s journey as an entrepreneur is a lesson in persistence and conviction in your own beliefs and ideas. We’re so glad we got an opportunity to have a chat with her. Do check out Brass Tacks’ beautiful and thoughtful clothing at their website, brasstacks.co.in. Also, If you know someone who is deserving of an #intervue, feel free to shoot us an email at hello[at]vue45[dot]com!